Fylde Borough, The Video of the Fylde. The Lancashire Evening Telegraph, Thursday 20th Jun 1996. A NEW video showing the lesser-known delights of the Fylde Coast has been launched in preparation for the massive influx of visitors expected during next month's Open Golf championship. Fylde Borough, made by The Video Lab in St Annes, aims to put Lytham, St Annes and its surrounding areas back on the map as a choice stretch of the country's coastline. Director of the film and owner of The Video Lab, Donald Blakey, explained: "The film is a souvenir of the area showing the sort of things the borough has to offer. "It concentrates on the more tranquil parts of the area showing how the Fylde borough can make an attractive alternative to the hustle and bustle of Blackpool." He continued: "We're hoping visitors will buy the video and take away with them a slightly different memory of their visit." The 36-minute film, which covers Lytham, St Annes, Freckleton and Kirkham, has already generated a lot of interest among potential outlets, all of whom agree it is time parts of the Fylde other than Blackpool have a look-in on tourism. Mr Blakey said: "A large number of charity shops have opened in St Annes in recent years, and this is because businesses are finding it increasingly difficult to make a living. "Although they are all for good causes, we don't want the thousands of visitors coming for the golf to have this as the only memory of the area." 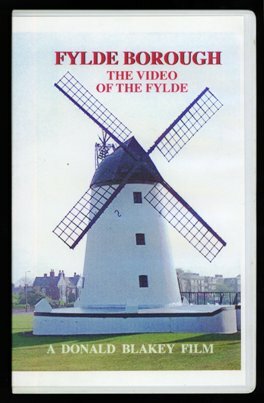 Fylde Borough, The Video of the Fylde, is on sale at JR Taylor, John Menzies, Stringers and other outlets priced £9.99.